Clarinet and piano make exceptionally congenial partners, for the dynamic range and particular tone quality of the clarinet enable it, wherever necessary, either to dominate the piano or to combine with it self-effacingly. Indeed, it fulfils these twin roles more effortlessly and effectively than any other instrument, whether it be woodwind, string or brass. Sir Charles Villiers Stanford (born Dublin, 1852; died London, 1924) was not only a prolific composer of every type of music, including opera, but also an immensely influential teacher of composition. Famed for his blisteringly caustic tongue, he must often have seemed to his pupils somewhat less than encouraging; yet he launched from the Royal College of Music an astonishing number of outstanding composers, among whom were Vaughan Williams, Holst, Bridge, Ireland, Howells and Hurlstone. 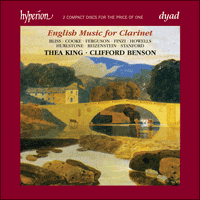 Stanford wrote only two works for clarinet; the present Sonata, completed on 28 December 1911, and the slightly earlier Concerto (recorded on Helios CDH55101). In both, his admiration for Brahms is evident, but the slow movement of the Sonata proves how potent, too, was the influence of the music of his own country (a ‘Caoine’, pronounced ‘keen’, is a type of Irish lament). Throughout the work Stanford’s great technical skill is shown by the beauty and transparency of the textures, and by the cunning way in which the thematic interest is so evenly divided between the two instruments. Howard Ferguson (born Belfast, 1908) studied at the Royal College of Music with R O Morris. His published compositions include orchestral, choral, vocal and instrumental works; but since 1960, when he found he had nothing more to say, he devoted himself to musicology, including editing the keyboard works of Purcell, Croft, Dagincour, Schubert and others. The Four Short Pieces were completed in 1936 from sketches begun four years earlier. They were first performed by Pauline Juler and the composer at Wigmore Hall on 12 October 1937. Though so short—an irreverent friend referred to them as ‘The Four Whitebait’—they are sharply contrasted in mood, and each one is written in a different ‘mode’ (the equivalent of white-note scales on the piano) beginning on the following notes: No 1, A; No 2, E; No 3, D; No 4, F.
Gerald Finzi (born London, 1901; died Oxford, 1956) studied privately with Ernest Bristow Farrar, Edward Bairstow and R O Morris. He is perhaps best known for his vocal works, which include a large-scale setting of Wordsworth’s Intimations of Immortality, the exquisite Dies Natalis for voice and strings to words by Thomas Traherne (both recorded on Hyperion CDA66876), and over forty songs on poems by Thomas Hardy, which whom he had a special affinity. (These are recorded on Hyperion CDA66876.) Apart from the Clarinet Concerto (recorded on Helios CDH55101) and Bagatelles, some of his more important instrumental works are the orchestral New Year Music, The Fall of the Leaf, and the Grand Fantasia and Toccata with solo piano. As so often with Finzi, the Five Bagatelles were written over a considerable number of years. They were completed during World War II, in free moments snatched from his work at the Ministry of War Transport, and first performed by Pauline Juler and Howard Ferguson at one of the wartime National Gallery concerts. The opening Prelude and final Fughetta are brilliant, extrovert pieces in similar vein to the corresponding movements of the Concerto. The Forlana is in a gently lilting 6/8 rhythm, interrupted only once by a more agitated moment. (The unusual title was used also by Bach in his Orchestral Suite in C, and by Ravel in the suite Le Tombeau de Couperin. It is defined in the dictionaries as ‘an Italian dance popular with Venetian gondoliers’.) The two remaining movements, the Romance and the Carol, are probably the earliest, and certainly the most typical of Finzi’s favourite mood of quiet contem­plation. The reflective beginning and end of the Romance are contrasted with a warmly lyrical central section; while the Carol reminds one of his lovely Christmas Scene In Terra Pax, in which the Gospel account of the Angel appearing to the Shepherds is framed by Robert Bridges’ poem describing a frosty Christmas Eve. As mentioned above, one of Stanford’s brilliant pupils was William Yeates Hurlstone (born London, 1876; died London 1906). At the age of eighteen he had gained a scholarship at the Royal College of Music, and by the time he left four years later he already enjoyed a considerable reputation. He was then known mainly for his chamber music, though he also wrote for orchestra, chorus, solo piano and voice. His fresh and individual talent had, however, all too little time to reach full maturity, for he was dogged by ill-health and died at the tragically early age of thirty. The Four Characteristic Pieces also exist in a version for viola and piano, as do the two Brahms Sonatas and the Ferguson pieces; yet there is no doubt that all of them sound better on the clarinet. The slow introduction to the Ballade is not unlike the opening ‘Once upon a time …’ of a story-teller, though the main part of the movement and the whole of the final Scherzo are both in normal sonata form. The Croon Song, as might be expected, is a lullaby; while the Intermezzo is similar in form, but not in content, to the typical Brahmsian Intermezzo in moderate tempo with a brisk middle section. Although Herbert Howells wrote much music in a wide variety of genres, one would hesitate to describe his output as prolific. His chamber music appeared only intermittently: indeed, the Clarinet Sonata was his last work in this field, although completed in 1951. It was written for the late Frederick Thurston who gave the first performance with Eric Harrison in a BBC Third Programme recital. When the work was published some years later, the composer dedicated it to Thurston’s memory. The Sonata is in two movements, and its form is perhaps the most obviously striking feature. No less arresting are its tonal organization and thematic integration which are worthy of the closest study. But over and above Howells’s compositional mastery, the emotional appeal and haunting nobility of the work combine to make this Sonata arguably the greatest of its kind since those by Brahms. Although written for the less commonly used A clarinet, it was originally published for clarinet in B flat. In this recording Thea King plays the work on the A instrument, where the low C sharp—called for at several points by the composer, and beyond the range of the B flat instrument—can be heard. The first movement opens with a placid, amabile figure on the piano, against the clarinet’s extended first theme. The piano quietly emphasizes a 3+3+2 quaver rhythm which assumes great importance. The inter-relationship between the clarinet theme—of memorable distinction—and the piano’s gentle undulation is very subtle, almost constituting a double exposition. The clarinet theme is restated, varied and contracted, during which important counter ideas are exposed. A sudden pause, and what seems like a dramatic second subject appears. In fact, this idea forms a bridge between the first theme and the second subject proper, for it is constructed from elements of both, and never reappears in this form. The second subject group—similar in mood to the first—is centred upon B minor, as opposed to the opening A–D modal ambience. If the exposition has been far from conventional the central development is also unpredictable. Utilizing all the expository material, it is extended and wide-ranging, and builds eventually to a climax at the summit of which the recapitulation—in G sharp minor—is upon us. This assumes the character of a second development, for it is constantly varied. The coda muses gently upon the clarinet’s opening theme, but the final A minor cadence declares the tonal roots of the movement. The second movement begins worlds away with a jagged and rhythmically abrupt figure on the piano which on extension sets the scene for a more definitive clarinet theme. This is full of rhythmic change, of constantly shifting emphasis and metre. Gradually, elements of the material from the first movement are recalled: the 3+3+2 rhythm, now stronger and more urgent; the initial contour of the opening theme – these, among others, pass by, but do not entirely dispel the underlying urgency of the movement’s propulsion. Little by little the fiery nature of the music recedes until, after a cadential clarinet solo, a gentle Lento appears, in tempo like a miniature slow movement but melodically revealing the connection with the second subject of the first movement which is recalled on the piano. The stage is now set for the reappearance of the first theme of the Sonata, from which all has grown. When it comes on the clarinet the emotional range of the work is complete: it is marked ‘Placido’ and a more profound or lyrical ‘home-coming’ would be hard to imagine. The short coda, Allegro assai, come primo, leading to a firm A minor, recalls the opening theme of this second movement, but the piano’s 3+3+2 accompaniment signifies the wholeness of this truly masterly composition. Bliss’s Pastoral for clarinet and piano was written either in December 1916 or in January 1917 during his military service, and the first performance took place on 17 February 1917. Originally Pastoral formed the second of two pieces, the first being Rhapsody. Pastoral was published in 1980, but the music of Rhapsody has never been published and the whereabouts of the original manuscript remain unknown. Pastoral is therefore one of Bliss’s earliest surviving works. Tonally, it is centred on D. Such a key, as always in Bliss’s music, is not rigidly adhered to: soon the long, arching clarinet theme which begins the piece hints at broader tonal regions. A secondary idea on the piano, marked ‘grazioso’, begins in a clear C major, although that too is not held for long as the clarinet takes up the new idea (with an important triplet insertion), again stretching the tonality. An extended piano passage leads to a quiet 6/8 aspect of the second subject. The 3/4 returns at the passionate climax before the piano ushers in the final part, Tempo primo, a gentle restatement of the long initial theme which now reveals its affinity with the second subject. Gradually the music winds to a pianissimo close, the bare fifth D–A leaving the mode unresolved. Although born in Germany, Franz Reizenstein lived in England from 1934 until his death in 1968. In his adopted country he made a significant contribution to musical life, both as a splendid pianist and as an accomplished and admired composer, as well as a greatly respected teacher. He studied with Vaughan Williams as well as with Hindemith and developed an impressively distinctive style. Although he wrote several large-scale orchestral works, possibly his greatest achievements as a composer are to be found in his extensive series of chamber works, notably the outstanding Piano Quintet and the Violin Sonata in G sharp. Early in his career, Reizenstein wrote a Sonatina for oboe and piano, and at the time of his sudden death he was working on a companion piece, a Sonatina for clarinet and piano, two movements of which were completed. They were published posthumously and, as is sometimes the case in such circumstances, the two movements make an effective work by themselves. Thea King gave the premiere of the Sonatina. Arabesques (in spite of the plural title, the work is in one short movement), also for clarinet and piano, likewise dates from Reizenstein’s prolific last year and might have been a forerunner of the Sonatina. Arabesques forms a striking and imaginative piece in ABA form, A being a truly arabesque-like phrase in 3/4, initially stated by the clarinet, centred upon B flat major. This is much developed and extended, and the central section, Poco più mosso, is a less florid theme in 12/8 which turns in and around itself via F sharp minor and B, from which the clarinet returns to the opening. The reprise is not strict and builds to a finely controlled climax from which the music gradually descends, all passion spent, to an unalloyed B flat major. The clarinet’s high pianissimo B flat is particularly magical and slowly the curtain is drawn on this haunting and fastidiously written short study. Arnold Cooke studied for several years in the late 1920s with Paul Hindemith at the Hochschule in Berlin. (It was there that he met his fellow pupil, Franz Reizenstein. The two became close friends. Following Reizenstein’s emigration to England in 1934 their friendship deepened and continued until Reizenstein’s early death in 1968.) In Arnold Cooke’s impressive output there are three important works for the clarinet. A fine Concerto (recorded on Helios CDH55069) dates from 1955, and an equally impressive Clarinet Quintet followed the Sonata in 1962. The Sonata in B flat was written in response to a commission from the Hampton Music Club, and was first performed by Thea King with James Gibb at a recital in the Drawing Room of the Arts Council in London later the same year. It is a substantial piece in four movements. The first begins with a long bipartite theme of fourteen bars, the first four being the most important as they give rise to the theme’s extension and generate much of the movement’s argument. The music grows naturally and with finely controlled logic, yet remains fanciful and imaginative, and the wide-ranging development constantly discloses new facets of the material itself further developed. The coda is quiet, but not exhausted, as the B flat major, veiled for so long in the course of the movement, is planted solidly in the bass. The chord of B flat begins the Scherzando second movement with the clarinet’s irregular eight-bar theme spinning around the music like a skittishly playful kitten. The 2/4 pulse is constant, the syncopation and cross-rhythms are all the more effective for being felt against an unvaried metre. The movement is virtually monothematic, the composer’s remarkable resourcefulness extracting much from such a tiny cell. The slow movement, Adagio ma non troppo, begins in the somewhat surprising key of D flat minor. The movement enshrines the emotional heart of the work, but Cooke does not display it on his sleeve: rather is the emotion understated, in a Leibnitzian manner. The form is tripartite, the central section auxetic in expression. The finale, Molto vivace, restores B flat in a fleet and infectious movement with rondo elements. The composer makes great play of unusual rhythmic pulse, and humour is always bubbling underneath. An exciting moment in the coda combines the piano’s basic 6/8 with a 3/4 clarinet figure before four great allargando chords reinforce the home tonic with splendidly affirmative rhetoric. A feature of the clarinet part in this work is the use of the rising octave: a characteristic of the instrument that was suggested to the composer before he accepted the commission. Of all wind instruments, it is perhaps the clarinet which can encompass this best, and Cooke’s writing reveals this aspect of the instrument admirably. One final small point is Cooke’s deliberate avoidance of the major or minor mode within his title. This acknowledges his own fluid harmonic thinking, but should prepare the listener, as the composer often keeps us guessing—is it major or minor?—until the very last moment.